As a girl with sensitive skin, face masks can often be a bit problematic for me. I LOVE a good face mask, I love the pampering ‘me time’ aspect of a mask, but occasionally my skin just doesn’t like them – those with sensitive skin will know what I’m talking about! The Charcoal Rescue Masque has been designed specifically to detoxify and brighten skin. It uses a combination of charcoal, volcanic ash, sea silt, bamboo and sulphur to draw out excess oil and impurities, refine pores, calm redness, and improves skin texture and smoothness. They promise this will result in a healthy, vibrant and balanced complexion. Activated Binchotan Charcoal – this draws out excess sebum, toxins and other impurities from the skin. Activated charcoal, which has a negatively charged surface, attracts and binds itself to positively-charged toxins, helping to remove them from the skin. Sulphur – this promotes cellular turnover, resulting in brighter skin. It removes dead skin cells and combats breakout-causing bacteria. It’s antibacterial and anti-inflammatory, and ideal for calming rosacea, eczema and sebaceous dermatitis. Volcanic Ash, Hot Spring, Marine Silt (mud), and Bamboo Stem Extract – these are all physical exfoliants to leave skin smooth and revitalised. Phytic, Lactic and Mandelic Acid – these are chemical exfoliants which accelerate cellular turnover, increasing collagen production and brightening skin. Niacinamide – to combat redness, inflammation and congested pores. Chilean Wild Mint – to improve skin texture and reduce the visibility of pores. The Charcoal Rescue Masque is really easy to use, you just apply generously to clean skin – avoiding the eye area, and leave on for 10 minutes. You’re then advised to lightly massage into the skin with wet hands to help with exfoliation during removal, and then rinse thoroughly. 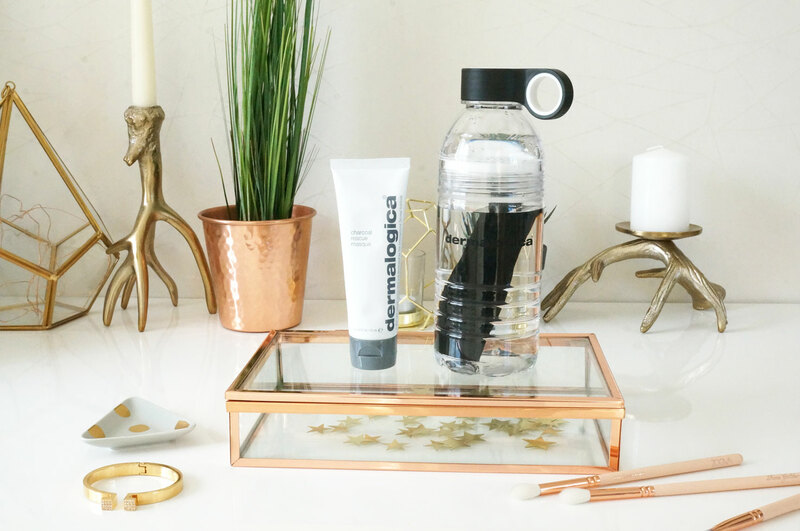 I also wanted to mention that Dermalogica kindly sent over this rather interesting looking water bottle along with the Charcoal Mask. This bottle has an actual lump of charcoal in it – to filter out impurities. How awesome is that! If you’re interested in reading more about this, you can check out the manufacturer site for more info here. The Dermalogica Charcoal Rescue Masque is £38.00 for 75ml, and available now at John Lewis.